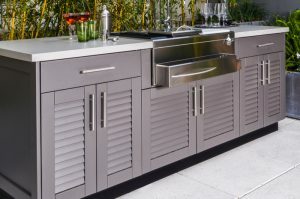 Outdoor Living Concepts introduces Danver Stainless Steel Outdoor Cabinetry. Danver Stainless Outdoor Kitchens cabinets are more than just storage – they are a necessary cabinet type for any outdoor entertainment space. If chosen carefully, outdoor base cabinets have the ability to simultaneously pull a space together and set it apart. The leader in outdoor stainless steel cabinetry, Danver Outdoor Kitchens manufactures an extensive line of stainless steel base cabinets to develop fully-functional outdoor kitchens. With unique door styles and powder coat options, Danver’s base cabinets allow for endless design possibilities. Available in a variety of colors, configurations, sizes, styles, and designs, Danver’s steel base cabinets help you bring outdoor living to life! Full height kitchen cabinets are available in 3” increments, from 9” to 48” widths. 24” wide cabinets can be specified with one or two doors. OBF cabinet pictured is shown with the optional Key West Door and a powder coat (nu-black hammertone) finish. Cabinets up to 24″ in width have one door, cabinets over 24″ have two doors. While the standard outdoor cabinet depth is 27 7/8” (including door), a 24 7/8” depth may be specified. Total height is 34 1/2”. The cabinet box is 30”H plus 4 1/2” adjustable legs. A square shaped tapered stainless steel leg with adjustable feet is also available for an open contemporary look. Black or stainless toe kick may be ordered separately and cut on-site. Stainless pulls are included. Shelves are optional – fixed or pull out. Danver’s stainless steel drawer/door cabinets complete the outdoor kitchen adding valuable storage space that combines function and design. Danver’s outdoor stainless steel drawers display premium features including double-wall construction, full extension, under-mount glides and “soft-close, self-close” technology. Made from the same highest quality industrial grade stainless steel as our outdoor cabinetry, drawer/door cabinets can be added throughout the cooking area and fit almost all outdoor kitchen designs. The drawer/door cabinets are available in 3” increments from 9” to 39” widths. The standard outdoor cabinet depth is 27 7/8” (including door), however, a smaller 24 7/8” depth may be specified (standard depth for indoor use). The total height of the stainless steel drawers/doors is 34 1/2” – the cabinet box is 30”H plus 4 1/2” adjustable legs. OBD Door/Drawer cabinet (OBDXX11) pictured is shown with the optional Key West Door and a powder coat Pearl Copper finish. 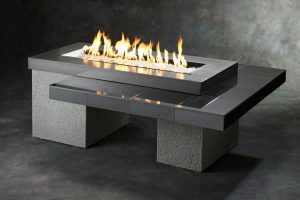 Design options include a tapered stainless steel leg with an adjustable foot available for an open contemporary look. Black anodized toe kicks may be ordered separately and cut on-site. All drawer/door combinations include stainless steel pulls. Stationary and pull-out adjustable shelves are available. Powder coat finishes can be applied to the drawer fronts to match the outdoor cabinet door style and provide additional protection. Cabinet shown with optional Key West Door with Nu-Black Hammertone Powder Coat Finish. The Door/Drawer (OBD) and the Full Height Door Cabinets (OBF) are also adapted for pull-out trash containers. Multi-Drawer Cabinets are available in 3” increments from 9” to 36” widths. While the standard outdoor cabinet depth is 27 7/8” (including door), a 24 7/8” depth may be specified (standard depth for indoor use). Total height is 34 1/2” – the cabinet box is 30”H plus 4 1/2” adjustable legs. A tapered stainless steel leg with adjustable foot is also available for an open contemporary look. Black urethane and stainless “toe kick” are ordered separately and cut on-site. Stainless pulls are included. Drawers display premium features including double-wall construction, full extension, under-mount glides and “soft-close, self close”. OBM cabinet pictured is shown with the optional Key West Door and a powder coat (nu-black hammertone) finish. The outdoor kitchen sink cabinet you have your eyes on is available in 3” increments, from 15” to 48” widths. 24” wide cabinets can be specified with one or two doors. Cabinets under 24″ in width have one door. While the standard outdoor cabinet depth is 27 7/8” (including door), a 24 7/8” depth may be specified. Total height is 34 1/2”. The cabinet box is 30”H plus 4 1/2” adjustable legs. A square shaped tapered stainless steel leg with adjustable foot is also available for an open contemporary look. Black or stainless toe kick may be ordered separately and cut on-site. Stainless pulls are included. Doors have a PVC core to add “heft” and weight to provide a solid close and feel. Shelves are optional – fixed or pull out. Contact us to learn more about outdoor sinks and cabinets today! All trash cabinet standard depths are 27”. For 24” depth cabinets, specify -24 after item #. For example OBT1510-24. Trash cabinets can also be inserted into 36”, 42” & 48” grill and 15”- 24” side burner cabinets (OTPXX trash pullout Accessory). The 15” cabinet has 1 trash basket, the 18”, 21” and 24” contain 2 trash baskets. Danver’s appliance cabinetry accommodates nearly every outdoor kitchen appliance available, including a variety of grills, side burners and power burners, as well as pizza ovens, egg-style smokers, beverage centers and more. Each appliance cabinet is manufactured to fit your outdoor appliance with precision. In addition, Danver provides homeowners the opportunity to incorporate color, style and design into the cabinets housing your outdoor kitchen appliances. The OPB Cabinet has additional support for the weight of the ovens (up to & over 400 lbs.). Always specify the appliance base cabinets 6” wider than the appliance. A “trim kit” is installed during fabrication that is specifically designed for each appliance. The trim kit tucks-in behind the control panel of the appliance to ensure a proper fit. Appliance cabinets have been designed to accommodate side burners, gourmet power burners in both standard height and new low version for “boils”, refreshment/bartending centers, sear pods, pizza ovens, egg smoker grills, etc. Appliance bases are specified 6” wider than appliance width. Include manufacturer’s name and specifications for quote or with order. A “trim kit” is specifically designed for every major manufacturer’s appliance to insure a proper fit. Standard appliance cabinet depth is 27 7/8”. Total height is 34 1/2”, same as storage cabinets. Stainless pulls are included. Extra depth cabinets are available in most every size to accommodate those grills that require. Danver not only has stainless steel cabinetry for the most coveted cooking appliances and bartending centers on the market, we also sell them. The cabinet shown is the OBB3002L (low) designed specifically for the Alfresco Versa-Power Burner so when using large stock pots , the chef can check inside for proper cooking. There are two cabinet styles — one placing the burner at countertop level and the recessed cabinet (low) placing the burner 7” below the countertop. The more popular recessed cabinet offers more convenience for stock pot cooking. Appliance bases are specified 6” wider than appliance width. Include manufacturer’s name and specifications for quote or with order. A “trim kit” is specifically designed for every major manufacturer’s appliance to insure a proper fit. Standard appliance cabinet depth is 27 7/8”. Total height is 34 1/2”, same as storage cabinets. Stainless pulls are included. OEB Cabinets have additional support for the weight of the smoker grill eggs (up to & over 200 lbs.). Bartending Center And Cocktail Station Base Cabinets are available in widths from 24” to 48”. They are available standard with 2 doors. You can specify the number of shelves (available separately). Appliance bases are specified 6” wider than appliance/specialty grill width. Include appliance brand and model specifications for quote or with order. A “trim kit” is specifically designed for each appliance to insure a proper fit. (Shown: OBC4802 in optional Nu-Black powder coat finish for use with a 42″ Glastender Cocktail Station).Standard outdoor cabinet depth is 27 7/8”. Total height is 34 1/2” — cabinet box is 30”H plus 4 1/2” adjustable legs. A tapered stainless steel leg with adjustable foot is also available for an open contemporary look. Black and stainless “toe kick” are ordered separately and cut on-site. Stainless pulls are included. Stationary and pull-out shelves are available. All grill base cabinets standard depth is 27”. For extra depth cabinets, specify V instead of the O in the item #. For example VGB3640. The leader in stainless steel kitchen wall units also has an eye for style. The stainless doors and drawer fronts have a #4 brushed vertical grain to provide a rich contemporary look. Danver also offers unique door styles and powder coat options. The modular cabinetry provides designers and home owners with infinite flexibility in design configurations. Outdoor wall cabinets are available in 3” increments from 12” to 36” wide. Standard heights also start at 15” and go to 42”. The outside dimension is 13” (137 /8 ” including door). Two doors are furnished with cabinets 24” to 36” in width. The line includes diagonal corner and blind corner wall cabinets. Every cabinet is supplied with a top and bottom finished panel, stainless pulls and European style stainless hinges & hardware. Finished side panels are optional and are available in two configurations: flush to the cabinet side and as a 3 /4 ” thick panel flush to the face of the door. Doors may be ordered in different styles and open for glass (OFG). For “low maintenance” requirements, they can be painted in powder coat specified colors. Powder coat versions of several wood species are also available. Wall cabinetry may also be fitted with standard or stainless legs and used as shallow depth base cabinets. 1 – 3 shelves are included, depending on the height of the cabinets. On all single door cabinets specify right or left hinge. Wall corner units are available as well to fit directly over the coordinating bases. We also offer refrigerator depth (24”) cabinets in a variety of widths and in 12” and 15” heights. Finished end panels, both flush and 3/4” thick are available. Our Specialty Cabinets are corner units and Tall cabinets (primarily used indoors) which can be used for storage or house wall ovens and appliances. While the standard outdoor cabinet depth is 27 7/8” (including door), a 24 7/8” depth maybe specified. Total height is 34 1/2”. The cabinet box is 30”H plus 4 1/2” adjustable legs. A square shaped tapered stainless steel leg with adjustable foot is also available for an open contemporary look. Black Anodized or stainless toe kick may be ordered separately and cut on-site. Stainless pulls, hinges and screws are included. All tall cabinets are 24″ deep. Danver offers outdoor grill cabinets in many door and drawer configurations, including grill bases that include a warming drawer, refrigerator, deep grill accommodations, and come in ADA-compliant sizes. Full Door Grill Base Cabinets are available in widths from 27” to 62”. Depending on size, the door bases come with 2 (up to 48″) or 3 doors (over 48″). Grill bases are specified 6” wider than grill width. Include grill brand and specifications for quote or with order. A “trim kit” is specifically designed for each appliance to insure a proper fit. Standard outdoor cabinet depth is 27 7/8”. Total height is 34 1/2” — cabinet box is 30”H plus 4 1/2” adjustable legs. A tapered stainless steel leg with adjustable foot is also available for an open contemporary look. Black and stainless “toe kick” are ordered separately and cut on-site. Stainless pulls are included. Stationary and pull-out shelves are available. For extra depth cabinets, specify “V” instead of the “O” in the item #. For example VGB3302. D – designation for extra vertical space for grills that need it. Door/Drawer Grill Base Cabinets are available in widths from 27” to 62”. Depending on size, they will vary from 2 drawers and 1 door to up to 4 drawers and 1 door with almost every possible configuration in between. For extra depth cabinets, specify “V” instead of the “O” in the item #. For example VGB3302. D- designation for extra vertical space for grills that need it. Outdoor bbq islands have been evolving over the past few years. With the growth in homeowners adding outdoor living and entertaining areas in their backyards, more fully functional outdoor kitchens have been replacing the traditional barbecue islands. Many people still like the idea of stone, stucco or masonry islands, but the traditional stainless inserts lack functionality. 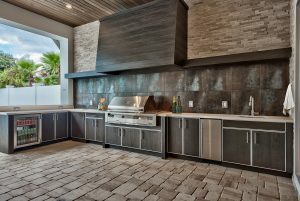 The trend now is to build a surround from the island materials, but to insert stainless cabinets instead to create a fully functioning outdoor kitchen. Because it’s an investment to have masonry or other materials built-in, it is cost-effective to complete the design with stainless steel grills, burner units, doors, drawers and shelves that deliver long life. Our stainless products come with a limited lifetime warranty. You can be every bit as organized as with a complete outdoor kitchen when you add storage components to barbecue islands. Barbeque islands add value to a home and pleasure to outdoor entertaining. Danver Inserts offer landscape architects, masonry kitchen island designers & fabricators and contractors a complete line of door, door/drawer, drawer combinations and “pullouts” to construct a totally functional kitchen. Doors exhibit the same quality, “heft and weight” and solid close as the Danver cabinet line allowing the inserts and cabinets to be mixed and matched in masonry islands while retaining a consistent “look”. The line features the optional Clean-Stor® box that attaches to door fronts to create useful storage and organization. Boxes are 22 1/4″ deep. The Clean-Stor® box eliminates the infamous “masonry black hole” that lurks behind access doors. The steel construction is superior to presently used insert materials that are subject to warping, rotting and mildew. The Clean-Stor® box comes with a shelf and provides clean dry storage. Drawers display premium features including double-wall construction, full extension, under-mount glides and “soft-close, self close”. Doors exhibit the same quality, “heft and weight” and solid close as the Danver cabinet line allowing the inserts and cabinets to be mixed and matched in masonry islands while retaining a consistent “look”. Our Accessory Inserts offer the consumer convenient trash disposal, propane storage and a paper towel dispenser. Just what is needed in the outdoor kitchen environment. The Island Insert line features the optional “Clean-Stor®” box – The Clean-Stor® box eliminates the infamous “masonry black hole” that lurks behind access doors. (Shown with access doors). The steel construction is superior to presently used insert materials that are subject to warping, rotting and mildew. The Clean-Stor® box comes with a shelf and provides clean dry outdoor kitchen storage. Galvanized Storage Box to install behind frame (order at the same time as Access Doors), all Clean-Stor boxes are 22 1/4″ Deep. Danver Stainless Outdoor Kitchens brings function and style together through our exclusive door styles. Our stainless steel cabinet doors and drawer fronts provide functional strength and durability, while the extensive color palettes, realistic wood grains, metallic hues and other decorative powder coat finishes bring style, color and design to what was once a drab space. Standard slab door with vertical #4 brushed stainless steel. Available in traditional stainless or powder coated color or realistic wood grain. A Key West style door with a frosted glass center panel showing a sea glass look. Available in: Sky Blue, Seafoam Green and Cloud White. A flat 1-piece door frame which is prepped for glass, or wood grain insert, or stainless steel panel (not included). 1 1/16” wide stiles &amp; rails with a center panel that can be powder coated stainless steel, traditional stainless or sea glass. Classic Key West frame with a frosted glass center panel, available in your choice of any powder coat color from the Danver color palette. Is a solid panel stainless steel door. It is our standard door and drawer front. It’s style is used for end panels as well. Is a 5-piece stainless steel construction shaker-style door. It features 2 11/16″ wide stiles and rails. Since the doors are assembled after each component is painted, the center panel can be painted to match or complement the stiles and rails. Is a flat 1-piece door frame which is prepped for glass, wood grain insert, or stainless steel panel (not shown). It is our most popular glass front door. Both styles can be used outdoors. Is a Key West style door with a frosted glass center panel representing the look of sea glass. It is available in three colors: Sky Blue, Seafoam Green, and Cloud White. The durability of stainless steel resists stain or corrosion and although stainless steel outdoor kitchen cabinets and doors are stain-resistant, they must be cleaned periodically. Harsh chemicals like chlorine and muriatic acid and salt from the ocean will mar the stainless steel if not cleaned regularly. Powder coat finishes add an additional level of protection against the elements. Danver offers a variety of nearly maintenance-free powder coat finishes including colors and wood grain finishes. 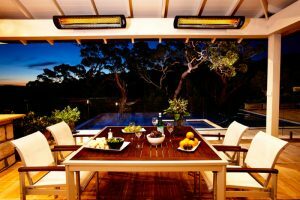 Implicit in creating a beautiful outdoor kitchen is the addition of color. Danver offers a palette of 13 colors and 9 realistic wood grain powder coat finishes. If you are blending with the landscape, or continuing an indoor theme, these rich powder coat finishes offer countless opportunities. While customizing the look and feel of the outdoor living area, Danver’s powder coat finishes adhere directly to the stainless steel cabinets and provide a virtually maintenance-free finish. The powder coat finishes protect your outdoor kitchen from harsh chemicals such as chlorine and muriatic acid as well as protecting them from the elements such as salt from the ocean, rain and snow, heat and cold, even the desert sun! Due to variations in monitor settings, colors and finishes are representative and may vary from the actual finished cabinet.